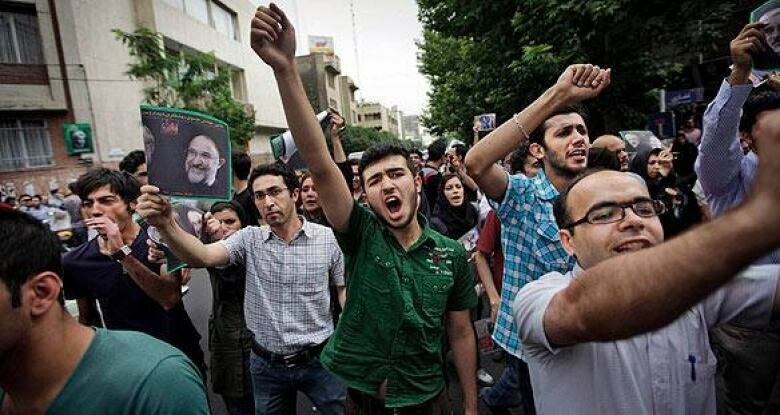 Political dissent in Iran in the aftermath of the national election has spread not only to the streets of Tehran, but also online, where protesters of President Mahmoud Ahmadinejad and observers of the election have battled to get news out of the country for three days. Cellphone service was restored Sunday after it had been down since Saturday, but Iranians could still not send text messages from their mobile phones. Government filters have also cracked down on opposition party websites and social networking websites such as Twitter and Facebook, as well as mobile text messaging services. Satellite internet connections have also been disrupted. A look in pictures at the protests on the streets of Tehran and in other parts of the world since the June 12 vote. But that hasn't prevented bloggers and activists reporting from Iran by using proxy servers to get around the censors in a game of cat and mouse. Citizenlab, which runs out of the University of Toronto's Munk Centre for International Studies, is one of many groups making software available that allows citizens in Iran to sign on to a server that gives them secure access to web pages anywhere, bypassing government restrictions. The software, PsiPhon, has been made available for Twitter users, as the social messaging tool has taken centre stage as a source of news from Iran since Saturday. One of the more active posters of messages on Twitter, someone in Iran named persiankiwi, has attracted over 10,000 followers, with over 2,000 added since Monday at noon. "We are going offline to get a phone free for calling out. we are also moving location — too long here — is dangerous," the poster wrote at about 10:30 p.m. local time (2:00 p.m. ET), followed by a post an hour and a half later: "3 of our group missing from afternoon — we have no news from them." Twitter users in Iran have shared pictures from street protests, passed on information about which cities are affected by internet and mobile phone outages and planned rallies and further protests. There are also reports of distributed denial of service attacks (DDOS) being launched on Iran government websites, though it's not clear what effect they are having. The website of President Mahmoud Ahmadinejad displayed a message at 4:00 p.m. ET reading "The maximum number of user reached, Server is too busy, please try again later," but there are reports that internet access across the country is sporadic. As one person with the Twitter name azarnoush reports from Shiraz, Iran: "Internet is at the lowest possible speed."